Introduction: Targeted manipulation of complex biochemical signaling pathways in unraveling the complexities associated with human reproductive disorders, including infertility, appears to be an attractive immunomodulatory therapeutic strategy in reproductive medicine and disease. Toll-like receptors (TLRs), a family of evolutionarily conserved pathogen recognition receptors, are emerging as pivotal players in the pathophysiology of a spectrum of human diseases, including infertility. Inflammation and infections in the female reproductive tract are common causes of infertility globally; TLR immune surveillance initiates inflammatory responses to foreign pathogens. 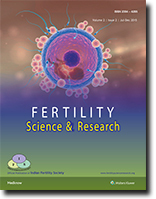 Materials and Methods: A comprehensive literature search using PubMed and Medline scientific database(s) (last accessed June 6, 2016) was performed, and accordingly the author included the selected articles in the present review; public health research studies for developing cost-effective infertility assessment programs in low-resource settings targeting North Indian couples are ongoing so as to reduce the burden of disease as well as psychosocial factors associated with infertility. Results: Significant recent advances in microarray and next-generation sequencing technologies have enabled the application of whole-genome approaches to the study of infertility; successful implantation requires synchronization between the acquisition of implantation competency by the blastocyst and a receptive state in the uterine endometrium. Conclusion: The author speculates that immunomodulation of cell-specific ligand–receptor interaction(s) is essential for initiating the subsequent intermediate/downstream events in signal transduction pathways, eventually leading to specific cellular/biological response(s); in this context, TLR-based therapeutics and subsequent TLR-based patient-centric biomarker research studies will certainly provide a more meaningful understanding of the pathophysiological basis of reproductive disorders, primarily infertility in the 21st century. Hypothyroidism is commonly seen in women in the reproductive age group. Overt hypothyroidism is associated with maternal and fetal complications and hence needs to be treated. However there is no uniform consensus whether or not a women with subclinical hypothyroidism should be treated or not. Review of literature was done using pubmed and online database search. ACOG does not recommend treating all cases of SCH in pregnancy. Other endocrine organizations do recommend treating SCH in pregnancy. Since there is lack of clear guidance treatment must be individualised for each patient. Objective The objective of this study was to explore young women's views about receiving information on the consequences of delaying childbearing. Design The study design was qualitative, focus group (FG) discussions. Setting This study was conducted at the Sexual and Reproductive Health Clinic in Aberdeen. Participants The study participants were young women (18–25 years of age) attending the Sexual and Reproductive Health Clinic. 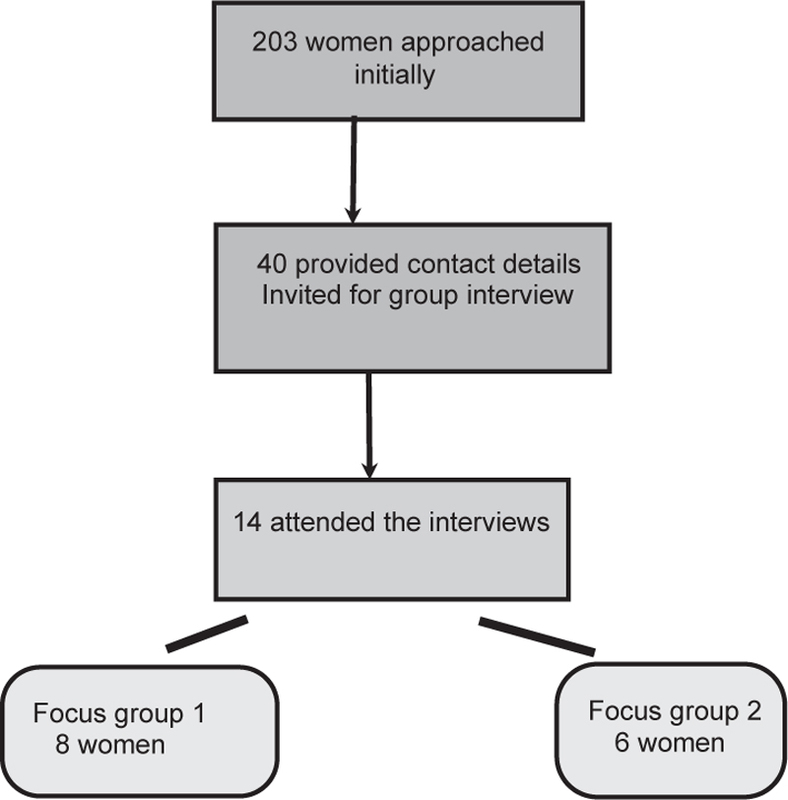 Methods Two focus groups with a total of 14 women, semi-structured interviews conducted. Main Outcome Measures The main outcome measures were young women's perceptions of receiving information about delayed childbearing. Results A range of factors impacting on childbearing decisions were identified ranging from personal circumstances such as financial and relationship stability to broader societal and cultural expectations. Social stigma associated with having children in the early twenties was found to be an important factor preventing women from having children earlier, even if they wanted to. All participants indicated a need for greater provision of information on the reproductive consequences of delayed pregnancy enabling them to make informed decisions about motherhood. There was consensus among participants that information should be provided in secondary schools as a part of the national curriculum, to both genders, in a nonthreatening and objective way. Conclusions There is a need to provide young women with fertility information. Further research is required to determine how this information could be incorporated as part of the national curriculum, without diluting the message of teenage pregnancy. Context: Intrauterine insemination (IUI) is widely used for fertility management for unexplained infertility (UI). Washed sperm are placed into uterine cavity to achieve pregnancy. The success rate of IUI with combined ovulation induction is always debated. Aims: The aim of the study is to analyze the effect of preovulatory pertubation with lignocaine, normal saline versus no-pertubation on conception rate during IUI cycle in women with UI. Settings and Design: A prospective, randomized controlled trial was conducted at University hospital tertiary referral center. Subjects and Methods: Of 464 women with UI, 320 women who fulfilled inclusion criteria were enrolled in the study. Ovulation induction was started with appropriate protocol. Women underwent transvaginal sonography till they achieved 2–3 dominant follicles of size ≥17–18 mm and endometrial thickness of ≥7 mm. Randomization was done by chit-pull system into three groups. Pertubation was carried out with low dose lignocaine or normal saline after 12–14 h of human chorionic gonadotropin administration. 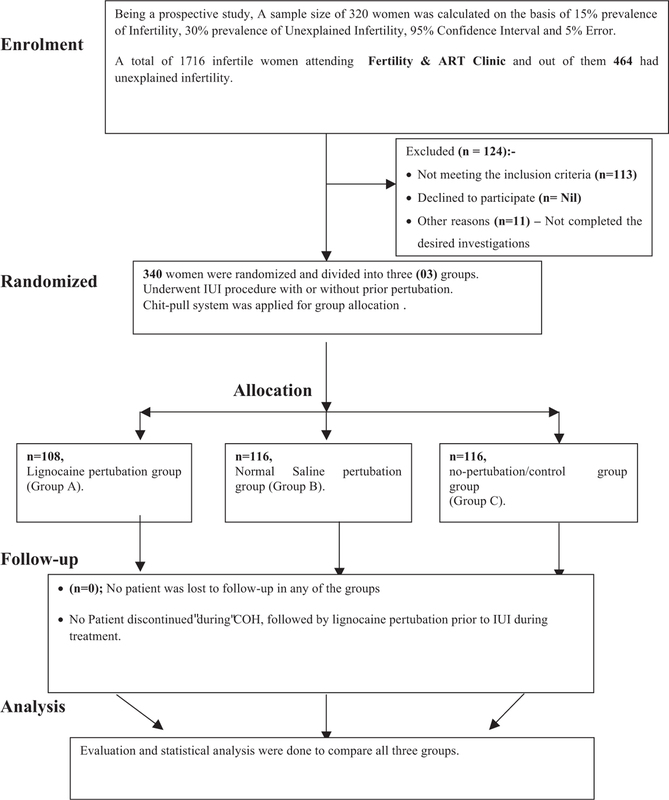 Pertubation groups were compared with no-pertubation IUI group. Statistical Analysis: Data were compared with unpaired Student’s t-test and Chi-square test appropriately. Results: Conception rate was 7.4% in lignocaine group, 20.7% in normal saline group, and 10.3% in control group. Conclusions: Pertubation with normal saline was associated with significant increase in IUI conceptions and live births as compared to no-pertubation group. Lignocaine pertubation was associated with the lowest conception rates but outcomes were not significantly different from the control. Hence, preovulatory saline pertubation prior to IUI is recommended to improve pregnancy rates in UI. Objective: To assess the clinical outcomes using gonadotropin-releasing hormone (GnRH) antagonist protocol in in vitro fertilization (IVF) cycles in a private practice set up in India. Design: Retrospective analysis. Setting: Private IVF center, New Delhi. Patients: Between July 2014 and December 2015, 510 self cycles were evaluated. Interventions: Controlled ovarian stimulation (COH) was started on cycle day 2 using gonadotropins (225–450 IU daily) and GnRH antagonist was added on the day when follicle reached 13–14 mm. When follicle reached 18 mm, transvaginal ultrasound guided oocyte aspiration was performed before 36 h of human chorionic gonadotropin (hCG) trigger. Embryo transfer (ET) was done on day 2/3/5, according to the embryo growth and beta-hCG was done after 14 days of ET. Scar herniation of solid abdominal and pelvic organ, other structures, for example, fallopian tube, is extremely rare in the pregnant women. Incisional hernias are not uncommon but obstetric complications during pregnancy due to an incisional hernia are very rare. Here, we report a case of fallopian tube evisceration or incisional hernia through a previous scar. A 26-year-old young female, G2P1L1 at 26 weeks of gestation with a history of previous cesarean section presented to our hospital with complaints of something coming outside of abdomen through the left side of the previous scar on the anterior abdominal wall since 15 days. The patient was examined and investigated and planned for laparotomy. Her preoperative finding was there was herniation or prolapse of fimbrial part of fallopian tube through scar was found. Gravid uterus size was corresponding to 26 weeks of gestation age. Right adnexa and left ovary were normal. Prolapse was reduced manually and abdomen closed back in layers. Her postoperative period was uneventful and discharged with stable maternal and fetal condition. Fallopian tube evisceration is usually prone to misdiagnosis or delayed diagnosis. These cases should be managed by high index of suspicion. These cases are a diagnostic challenge to an obstetrician. Ectopic pregnancy is a life-threatening condition and is rising in incidence due to assisted reproductive techniques in the present era. Three simultaneous implantations in the fallopian tubes is very rare. A 39-year-old G4 A3 was diagnosed to have ectopic pregnancy 42 days after embryo transfer done elsewhere. She had recurrent early pregnancy losses of previous three pregnancies. The first two conceptions were after IUI for prolonged unexplained infertility, and the third pregnancy was spontaneous conception. On the day of admission, she was diagnosed to have two extra uterine gestational sacs of <2 cm on TVS and a β HCG of 4539 mIU/mL. Medical management with variable dose methotrexate was instituted after counseling. Her β HCG rose to 16,125 mIU/L and a review TVS revealed three gestational sacs, two on right side and one on the left side. The third sac measured 1.7 cm × 2.2 cm with small fetal elements after two doses of methotrexate and it was 16,102 mIU/L after completion of one course of methotrexate. She was treated with two doses of 200 mg of mifepristone and was given 2nd course of variable dose of methotrexate and followed by single dose of mifepristone. Her β HCG was 624 mIU/L after 76 days of ET and 33 days of starting therapy. She had spontaneous conception after 2 months of stopping therapy and delivered a healthy baby of 3 kg normally at term.